Discussion in 'Trees, Shrubs and Roses' started by Kildale, Feb 1, 2012. This small tree has flowered through most of January and still going strong today. stratsmom, runner1212 and donna in nc like this. 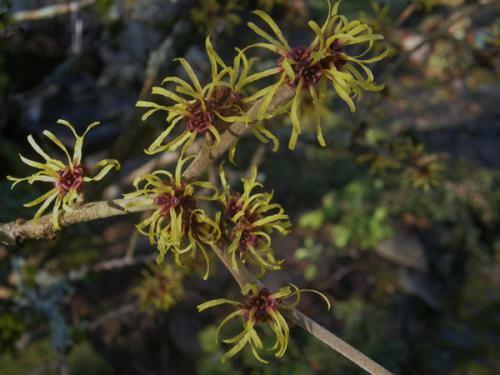 I have never seen a picture of Witch Hazel. It always comes in a bottle. Yes, its a great medical thing, we have one handy all the time. 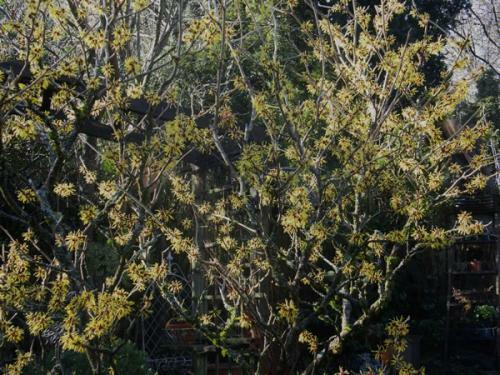 Oh my, I had forgotten about witch hazel! We saw it in the woods when we were in upstate New York, sometimes with snow on the ground and on the branches. Thanks for recalling a pleasant memory, Kildale. It blooms here in November sometimes. Kind of a shock to see flowers of any kind with all the leaves off the trees. We have many of these attractive trees around the countryside here. An early bloomer is always welcome after winter. What a neat looking tree. I am looking for a scratch and sniff screen. Is there one created yet? Please hurry. These smell so nice. Thanks Kildale for the nice pic. I should have planted a named cultivar that blooms after the leaves have fallen. Mine blooms with the leaves still attached. But the form is so beautiful and its been there 7 yrs., it will stay.